Take a deep breath and dive into the mysteries of the ocean. Our understanding of ocean life has changed dramatically in the last decade, with new species, new behaviours, and new habitats being discovered at a rapid rate. Blue Planet II, which accompanies an epic 7-part series on BBC1, is a ground-breaking new look at the richness and variety of underwater life across our planet. 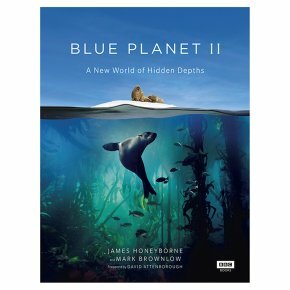 With over 200 breath-taking photographs and stills from the BBC Natural History Unit's spectacular footage, each chapter of Blue Planet II brings to life a different habitat of the oceanic world. Voyages of migration show how each of the oceans on our planet are connected; coral reefs and arctic ice communities are revealed as thriving underwater cities; while shorelines throw up continual challenges to those living there or passing through. A final chapter explores the science and technology of the Ocean enterprise - not only how they were able to capture these amazing stories on film, but what the future holds for marine life based on these discoveries.